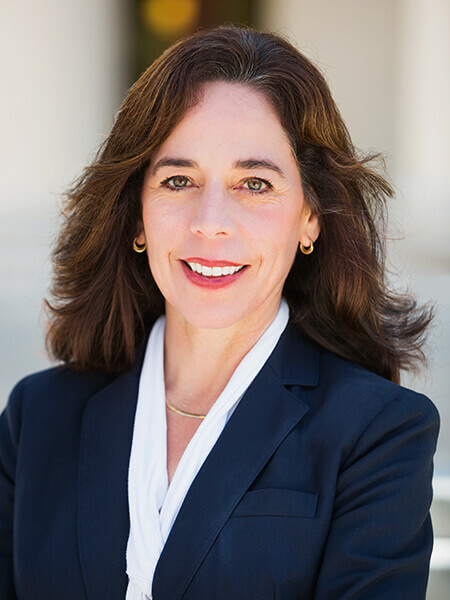 In 2016, Mara Elliott became the first woman elected as San Diego’s City Attorney. EMERGE America’s political training program may have given her the tools she needed to run for office, but her desire for justice and community service started when she was a little girl. Encouraged by her family and influenced by their experiences, Mara Elliott became the first in her family to graduate from college and go to law school. She’s now fighting for families and the vulnerable in her San Diego community, and with her role the possibilities for change are endless. Q: At College Magazine we’re working together with EMILY’s List, Emerge America, Human Rights Campaign, Higher Heights, She Should Run, Victory Fund, Running Start and IGNITE on an initiative to fight for equal representation in Congress called 50 by 2050. What are your thoughts on the goal of achieving 50% of women in Congress by 2050? A: I think it’s completely achievable as long as we start catching women when they’re young, like in college, and getting them prepared to run. So I love what you’re trying to do. 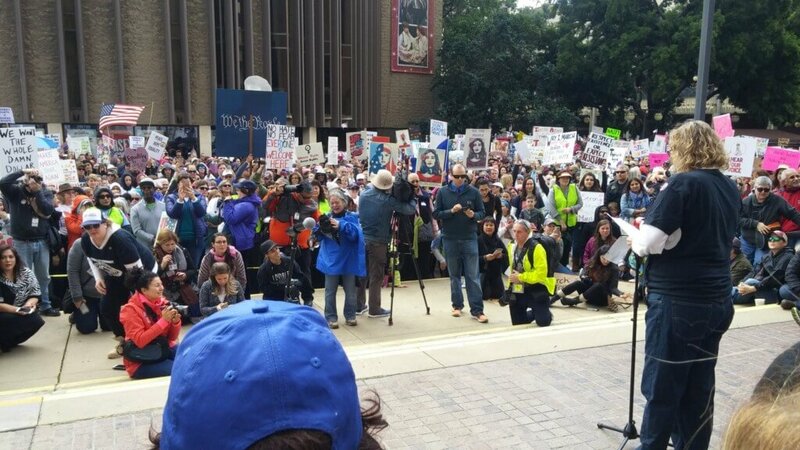 We’re trying to do something similar in San Diego. We just started a National Women’s Political Caucus here with the same purpose that you have, which is trying to inspire and train and have women start thinking about things early. Q: Can you speak more about the National Women’s Political Caucus? A: The National Women’s Political Caucus is nationwide, and when I was a young girl my grandmother was very involved with it. It helps women, and it’s not partisan, but primarily Democratic women will join. We train, we give them mentors and we provide opportunities. Since I’m one of the founding members here in San Diego, what I can do is to meet with people individually and help find them the opportunities that match their skill sets. 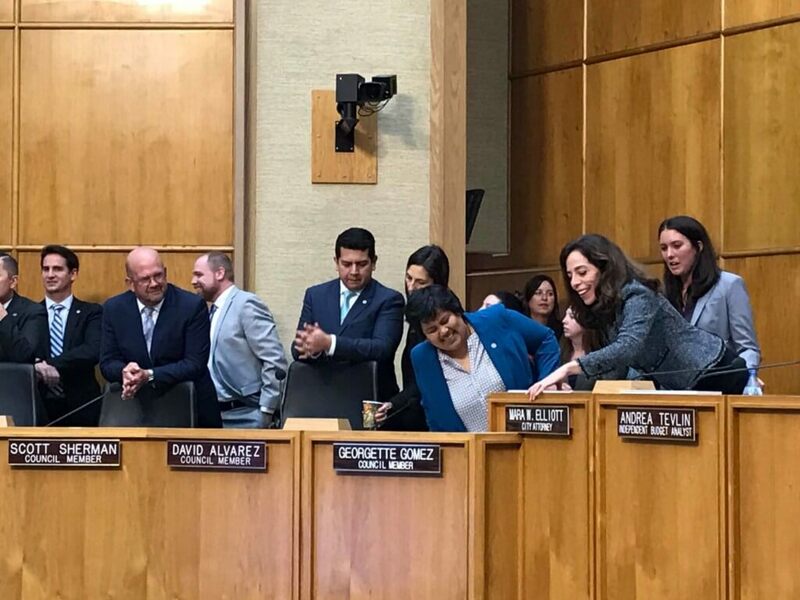 Because a lot of people don’t know what a water-board is, for instance, or that the city of San Diego has over 50 different boards, commissions and committees that you can be a part of. It’s really exciting. During my campaign that I just ran, I found out that I didn’t have the tools I needed here in San Diego to prepare to run. So I wanted to make sure no other woman has to go through that, because it can be very discouraging. So I had to seek training opportunities out of San Diego, and I joined EMERGE California. It’s a wonderful program, but we also need things that are more local. Q: Over the last year, we’ve seen more women running for office and getting involved in the process. How do you feel that will end up shaping the political sphere in this country? A: It’s a little harder for me to speak about the country. I could probably talk more about San Diego and my observations in being in city government. We never had a female city attorney before I won the election. I can see what the change is, when you can compare my predecessors, who were all men, to the agenda that I brought forward as attorney of the city. I hope that relates to the national level as well. I’m more keenly aware of domestic violence and how that impacts women and children. So we have expanded a number of attorneys we have working on that issue, and we’ve expediting restraining orders and trying to make sure that vulnerable segment of the population is protected. Also, the focus has been on preventing elder abuse. I think women are more in tune with these issues, because we’re often the caretakers of families. 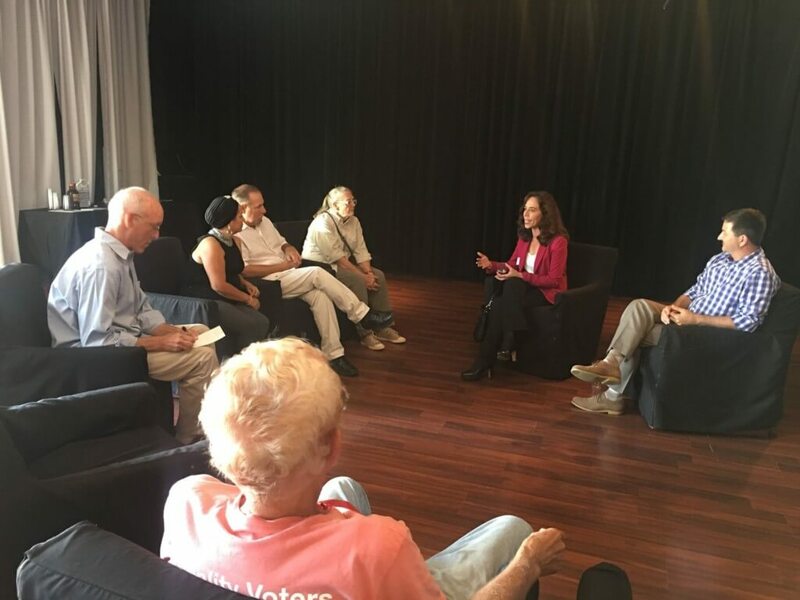 I’m expanding our reach in the city of San Diego to reach more closely with senior citizen facilities and talk about consumer abuses. We’re working to get restraining orders because often our elderly population is more vulnerable to people who are trying to steal from them or abuse them. The other way I think women change the conversation is that I’m more focused on getting to the root of the problem so we can help people exit the criminal justice system. Whereas I think, in the past, we’ve been proud of our conviction rates. A woman versus a man has a different perspective when we’re sitting and analyzing an issue. For example, if it’s a hostile work environment or harassment type of issue, most women have had that experience in the past, while men largely have not. So I would come up with a different approach to resolving the claim than I think a man would. That recently happened with a lawsuit that we settled, because I have been through a similar experience and I could see what could work and what wouldn’t work so we could solve the issue without having to litigate it. It’s an interesting perspective that we bring, because we’re often moms and caretakers. I think we just want a good result for our community. Q: What other issues are you most passionate about? A: The other is the environment, because San Diego is beautiful and people come here because they want to experience it. We have stepped up our enforcement, and we can prosecute those who contaminate our environment, whether it’s dumping battery acid in waterways or poaching protected marine life. We have gone out very publicly to say that when we prosecute we let our community know that we’re not going to take it and that we will hold them accountable. I think that’s been very persuasive. Also, ensuring that people are paid fairly for the work they do and that they receive a livable wage has been another priority here. We recently increased our minimum wage and we’ve been proactive in making sure that the minimum wage is being paid. We’re still in the early months of it, so it has been very challenging. There was a segment of our population, the restaurant industry, which decided they were unhappy, and they added a surcharge to their restaurant bills and they improperly classified them as state mandated surcharges. It was a way of making a political statement. And what it ended up doing was punishing the workers. We went out very publicly, threatened to prosecute those who misclassified these charges. I was very aggressive with trying to address that immediately. If I think I could sum it up: Fighting for families, protecting our most vulnerable populations like our elderly, our abused partners, our children and the environment. Just making sure that we’re protecting San Diego. That’s been my priority and where I spend most of my time, trying to figure out how to make the most impact. Q: Do you have a moment or project that you were involved in that has been the most rewarding of your career so far? A: We have what’s called a Family Justice Center here in San Diego. It has services for victims of domestic violence, and it has a one-stop shop if your intimate partner has abused you. You’re going to get medical attention, you’re going to find housing, you’re going to get help from the courts and you’re going to get counseling and clothing if you need it. It’s something I think that’s a wonderful place, but it’s not enough. We got one location in downtown San Diego. It hasn’t received the attention it’s needed for the last decade or so. I’ve placed a lot of emphasis on that Family Justice Center by increasing the number of attorneys we have there. But I just learned this week that I’m going to be able to take complete control over it. It’s under the police department right now, but it’s going to be my department. So I’m absorbing and what I’d like to do is turn it into a regional facility that services the entire county of San Diego. I think that it’s going to make a big difference. Q: What inspired you to get involved in law and public service? A: I was always one of those kids who tried to do the right thing. I love community service, I started doing it when I was very little, and I thought that law was the answer to leveling the playing field for a lot of people. And my mother is an immigrant from Mexico. I studied what she went through, what my grandmother went through, and they often didn’t assert their rights, because they were afraid of the system or they didn’t understand it. I thought, “If I was an attorney, I could be that voice for people who otherwise wouldn’t have that seat at the table.” So I always wanted to be a lawyer, ever since I was old enough to understand what a lawyer did. And my paternal grandmother, who was also from the United States, also dreamed of being a lawyer, but that wasn’t in the cards for someone who was born in the 1920s. So she encouraged that passion in me. I wanted to go into the practice of law and the public, which was community service. You don’t get rich on it, but you get the satisfaction of changing the world in your own way. I went to a law school that trains people to go into government work. Q: At College Magazine, we’re the guide to the undergraduate experience. In what ways did your experience as the first college graduate in your family prepare you for a career in law? A: It teaches you appreciation because I always remember that my family did not have the same opportunities as I did. And it put a lot more pressure on me to do well. I took the responsibility very seriously, and I wasn’t going to let them down. So I think coming from modest means, surviving on a working wage, I’ve always had the appreciation for the opportunity I was given and the responsibility of making sure that those who followed would have the same open door. I thought I got lucky. Q: What do you think is the best part of being involved in law and public service? A: I think being somebody that comes up with answers is the most fulfilling part of it. I love being the problem solver in the room, not the obstacle. When you’re in public service you identify what’s going to make your community better, and you can put all your energy to try and find that solution. And the challenge that I find fun is working with people who I may be completely politically opposed to, finding that common ground so we can get it done. I find that challenge just very intriguing, and you get that a lot, not just as a lawyer, but also being in government service. Q: Did you face any specific challenges as a woman running for office? A: Absolutely. I think running for office was the hardest, most humbling experience I’ve ever had. There were five people running for office. I was the only one who had worked in this job, so I was the only one who had relevant experience. But what I found on the campaign trail was that I was the person who got the hardest questions about my qualifications to lead. Men were assumed to already have them and to already be equipped to lead this office, despite not having the experience. I thought that was fascinating. Over and over again I had to explain why I was the most qualified to lead the office. The other thing that I think was challenging was, the men when they would speak about family life. They got a lot of “oooh’s” and “ahh’s.” An example was that I went to a forum one night and one of my opponents said, “I want to leave tonight by 8:30 because I like to tuck my kids into bed at night. I love my girls, and I want to tuck them in before I go to bed.” And the audience loved it and said that he was a darling father. I wanted to go home too because I have two boys and I like to tuck them in at night. I knew that if I said that, then the reaction would be very different. So I think that there’s still that questioning that you’re a mom and should you really be out there trying to compete for this. This is a high-profile, stressful job. So there’s still the mom aspect, and then you got the history. This city’s been around for hundreds of years, and we’ve never had a woman in this intellectual position that I now have. And I think the picture in mind is of a man, because that’s what we’ve always had. So I’ve had to work on breaking the mold. So you’re always on guard, you’re always professional. You can’t lend yourself to having a fit in public, or doing anything that looks like its emotional. You have to be careful. I was held to a higher standard than the people that I competed against. And I think the final thing that I’ll throw in there was that I was very surprised by women. I expected women would rally around me and try to help me succeed, and I found the opposite. They were my harshest critics and the most difficult to get support from. Just looking back on it, I think a lot of women question their own security in themselves, and they are not ready to see themselves in this type of position, because this is something that we’ve not seen here in San Diego. And I think every time one of us succeeds, the imagination of our possibilities open up. “What they encouraged us to do in college a lot was information interviews. But you set aside 15 or 20 minutes to have coffee with somebody and talk about what their careers are like. And I think that it’s an eye opener. It really helped direct what I did with my own career. And then you could follow up with an internship or whatever. It’s difficult to make a career decision when you’re so young too, so the more you can learn about the options, the better off you are. You don’t waste so much time trying to figure out who you are and what you want to do,” said Elliott. “Internships are very important. We have students who just want to learn, who come to figure out the issues. I encourage them to do the internships to the fullest extent possible. Because you learn about yourself when you go through those experiences. You learn what you like and what you don’t like, where you thrive and where you need to go back to work and learn new skill sets,” said Elliott.